Imagine walking on the stars or exploring the deep sea. 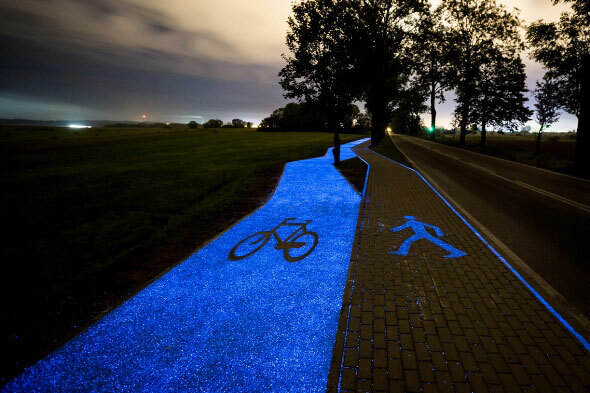 Lumina Path is lighting the way, delivering a Luminescent Pavement bio-light solution that requires no electrical infrastructure, relying instead on natural sun light to deliver a soothing, unique and magical galaxy-inspired nighttime glow. Revolutionising the way we light our public and private spaces and thoroughfares, this low cost and low maintenance alternative to powered infrastructure provides safety of passage and enchanting inspiration to pedestrians and cyclists. Unlike other superficial top-coat spray-on installations, the Lumina Path quartz stone scatter is applied only after a primer preparation of best practice mounting guidelines and parameters. This guarantees long-lasting durability through structural integrity. The Lumina Path product installation can be applied to existing hard, flat and structurally sound substrate, such as concrete, asphalt and tarmac. As a wearing course, re-surfaced application Lumina Path naturally rejuvenates the base installation, refreshing the structural integrity, durability and aesthetics. Alternatively, a new pathway or product installation can be delivered. Naturally slip-resistant, curing time is as little as twenty four to forty eight hours for foot traffic. 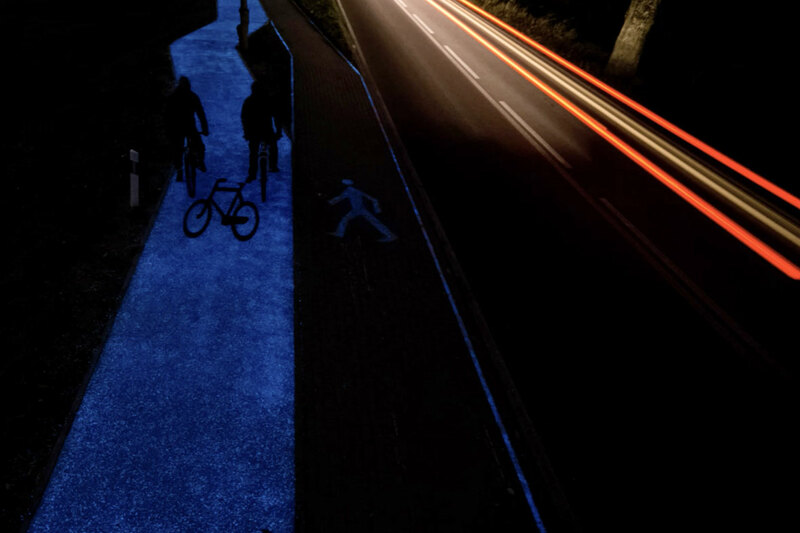 The Luminescent Pavement is made from a fine-aggregate quartz stone scatter, coated in a completely safe, non-toxic, environmentally friendly and long lasting luminophore. This patented luminophore is a natural, Earth-sourced powder. When sun-absorbed it becomes excited and delivers a proprietary bioluminescence flux; a soft ambient nighttime glow of iridescent blue, turquoise or yellow-green. Elegantly subtle, Lumina Path Luminescent Pavement is used in a variety of applications and installations, delivering both aesthetic and functional appeal. Simple to install and used both commercial and privately, this product installation is long-lasting and extremely low maintenance. 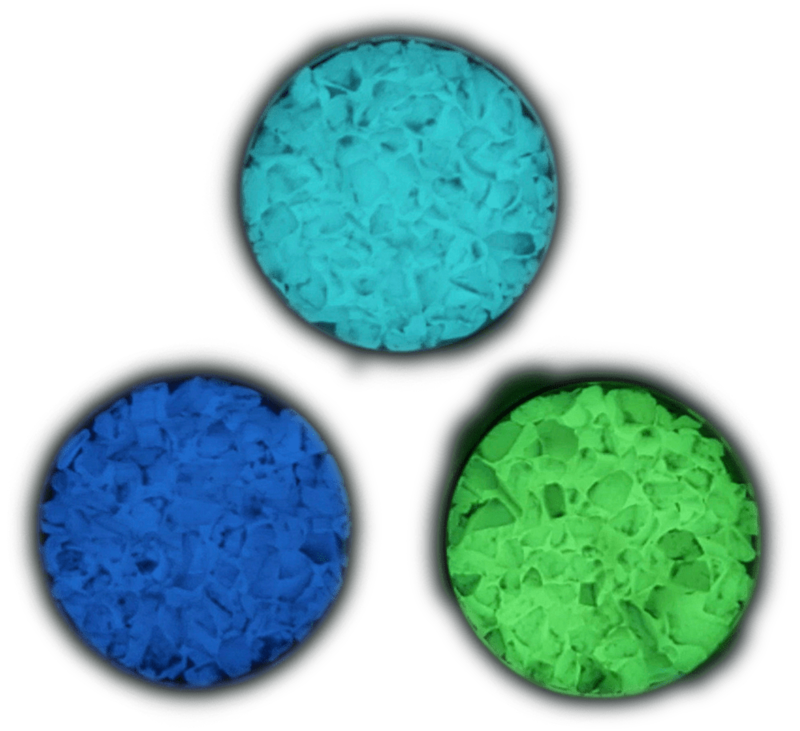 A glow in the dark effect is achieved by application of the phosphorescent materials – the next generation of luminophores. Luminophores are an organic or inorganic chemical compound and depending on the nature of the excited state of the compound, deliver illuminance through photon emission; a wavelength-weighted light flux. Lumina Path is Australia and New Zealand’s exclusive and therefore leading importer, distributor and installer of European, commercial-grade Luminescent Pavement. Marius was born and University educated in Poland, where he enjoyed over 20 years in the construction industry including Directorship before immigrating. Choosing Australia because of the abundant opportunity, he enjoyed trade contracting, studies Business Management at a prestigious Sydney learning Academy and manages the strategy and growth of Lumina Path. Spirited by wanderlust, Marius loves to explore the world and is passionate about travel, the thrill of new adventures. Roscoe has enjoyed over 20 years of experience internationally and locally as a Master Stonemason and Director of Sydney Stonemasons. His experience is vast and includes custodian workmanship on prestige and high profile projects including the Tower of London, Sydney Museum of Contemporary Art (MCA) and the Royal Botanical Gardens. With an eye for detail and perfect works, Roscoe prides himself on careful listening, understanding and exceeding customer expectation time after time. We pride ourselves on a culture of truth, integrity and respect. Key to this is communication – intelligent, practical articulation of the scope of works. From the initial enquiry, quotation, project management, mid-project review through to project completion and handover we ensure quality communication between all stakeholders; client, Lumina Path, third parties, suppliers and contractors. Lumina Path Luminescent Pavement has a product guarantee of 10 years but typically lasts 15 -20 years, depending on the type of installation, terrain type, variations in climate, usage and maintenance. Like most things, the better care you take of your new Lumina Path product installation the longer it will remain in service.